Player-coach Paul Cooke will not over-react to Sunday’s crushing 42-12 pre-season defeat at home to Hunslet Hawks. “We could have had a knee-jerk reaction and called the boys in last night, tonight, Wednesday or as many days as we wanted,” said Cooke. “But the game means nothing and there were no competition points up for grabs. 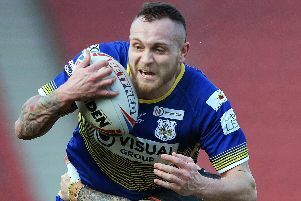 Cooke had expressed his satisfaction with how the club’s pre-season campaign was progressing following the spirited showing against a strong Castleford side last week and had been expecting more of the same on Sunday. “We didn’t see it coming but we’ve certainly got to learn some huge lessons from it and quickly,” he said. “People on the terraces had every right to be disgruntled by the performance and I would hope the players are hurting as much as I am and as much as those people who paid money to watch the game. “What we have to do is to learn some lessons from how we played in the first 25 minutes when all the energy got taken away from us by our own individual errors early in sets. Highly-rated scrum-half Richard Wilkinson, who missed Sunday’s game, was scheduled to see a knee surgeon yesterday.